We offer a number of discount schemes, Click Here to find out more. A very friendly and warm surgery where everyone is welcome. You will receive an excellent service with a smile. We also offer a caring mobile Chiropody treatment from a registered Chiropodist in the comfort of your own home or office. Residential homes, Nursing homes and Sheltered accommodation are also covered by our services. If you are one of those people who loves having their feet pampered or you want to treat that special someone. For an alternative present why not ask someone for some of our wonderful gift vouchers. 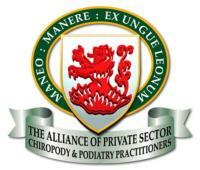 The HPC currently regulate 15 health professions: arts therapists, biomedical scientists, chiropodists / podiatrists, clinical scientists, dietitians, hearing aid dispensers, occupational therapists, operating department practitioners, orthoptists, paramedics, physiotherapists, practitioner psychologists, prosthetists / orthotists, radiographers, and speech and language therapists. All of these professions have at least one professional title that is protected by law, including those shown above. This means, for example, that anyone using the titles 'physiotherapist' or 'dietitian' must be registered with us. supports its members by working on their behalf to promote the business, negotiate benefits and recognition for practitioners, provide appropriate insurance, create CPD and development opportunities, dissemination of information and provision of education, representation of membership in national negotiations, registration matters, practitioner support, clinical support, business advice, fellowship and social interaction, Volitional Register provision, production of Journal, Annual Seminar, Open Clinical Forums, Benevolent Fund, etc. 25/01/2009. Welcome to our new look surgery. We have now re-opened and we hope you find it a more welcoming place to visit. 16/06/2010. Welcome to our new look website. We hope you find it more enjoyable to browes. Exit the roundabout onto A610 heading to Matlock/ Ripley /Ilkeston /A6096 /Eastwood/B6010. Take the A608 ramp to Heanor/Mansfield. At the roundabout, take the 1st exit onto New Derby Rd/A608. Continue to follow the A608 take a slight left toward Derby Rd/A608. Continue straight onto Derby Rd/A608 and follow the A608. At then traffic lights continue onto Church St/A6007. Continue to follow A6007 and turn left onto Ray St just after the market place. Exit the roundabout onto Mansfield Rd/A608. Go through 1 roundabout, slight left toward Derby Rd/A608. Head north on High St/B6179 toward High St/B6441. Turn right at Church St/B6179. At the roundabout, take the 3rd exit onto Nottingham Rd/A610. Continue to follow A6007 and turn right at Ray St. Slight left at Stores Rd. Turn right at Mansfield Rd. Turn left at Mansfield Rd/A608. Turn right at Abbott St. Turn left at Ray St.
We have recentley refurbished our premisis, giving you a more plesant treatment experience. 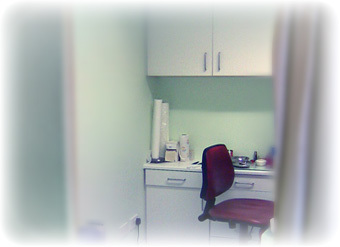 When you enter the surgery you will be greeted by the friendly staff who will see to you as soon as possible. 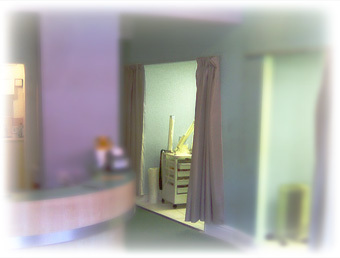 You will receive an excellent service with a smile from our HPC registered Chiropodist. With 14 years experience in the medical proffession. If you wish to contact us regarding any appointments enquiries please don't hesitate to get in touch. There are two ways to get in touch the first is by telephoning the surgery on 01773715751 and the second way is to email sarah1@fantasticfeet.co.uk or sarah2@fantasticfeet.co.uk. If you ring and answering service is on please leave a message and we will get back to you as soon as possible. If you just can't wait we always provide a cancelation appointment list if you really need treatment fast! We offer Family group bookings but please note a little more notice is required for these types of appointments. 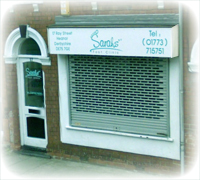 We offer caring mobile Chiropody treatment in the comfort of your own home or office. We visit individual houses covering a wide area in the Nottinghamshire / Debyshire district. We also visit nursing and residential homes and also sheltered accommodation in the the same area. The two Sarah's run the surgery with the help of our other FHP and the our three friendly reception staff. We offer kind and careful treatment ranging from treating corns, callus, varucers, cracked heels, nau dystrophies and many more conditions. Although we are the most reasonably priced chirpodists in local area for surgery and outside visits we still offer special discounts. We offer great value for money with all of our services but did you know about our discount for O.A.P's to find out more contact us for more details. We sell and offer advice on dressings, creams, sprays, files, to treat any condition, wheather it be fungal, viral, excessive plantar, fascittis, chilbains and other skin conditions. Refreshments are always offer to all our patients whilst you wait.